Last summer, we helped Sarah and Jeff plan their adoption fundraiser and we're so grateful that Caley Newberry Photography was on hand to capture the event. But what's better than a great event? On November 7, Sarah and Jeff finalized the adoption of their daughter Melrose! There is no questioning their love of that little girl and goodness she is cute! Sarah was just a work friend of my husband's when I began helping her plan their fundraiser, but I was excited to be involved because adoption has a special place in my heart. Why? I suppose because my aunt was adopted when I was just a baby. She is part of our family, whether blood or not, and it has always felt normal, it never felt strange or out of place (though we did have fun joking about how my aunt was younger than me, especially when we were in school together). As an adult, I have had many friends welcome adopted children into their family and it has been beautiful to watch, even when I see how difficult it can be. Being given the opportunity to help a couple find the finances to become a family was such an honor. And I was lucky enough to gain new friends in the process! I am so thankful to the many vendors who helped us pull off a successful event - we raised over a third of their adoption costs! How did we thank our vendors? Prior to the fundraiser, we coordinated a style shoot to give a little thank you to the vendors who gave of their time and resources to put together our event. The shoot was featured on Every Last Detail blog! And of course our couple was Jeff and Sarah. A little celebration of their marriage, the basis for their budding family. We were able to get most of our items and the space donated, while our food was secured at a reduced cost. Tickets were sold to cover the food, beverage, and other small costs. A few sponsors also helped with our costs and added to their profit. The majority of their fundraising was secured through a wine pull and silent auction. What did the evening consist of? GranDale Manor opened their entire downstairs for our use and set up tables and chairs for dinner! We welcomed guests in the foyer where they could buy a ticket for the wine pull. Two rooms held our silent auction items with an open bar of beer and wine, served by Mangia staff members. Signage from A Mint Macaroon directed and thanked our guests. In the back, Mangia set up a buffet of salad, pasta, lemon rosemary chicken, seasonal vegetables, focaccia bread, and drinks. Baked in Nashville provided a spread of cookies, French macarons, and a cake (it was ALL delicious). Rachael Ann's provided a gorgeous arrangement and the main florals, including a mantle piece styled by Feather+Oak. Additional event florals were provided by Kennedy Occasions; Posh Occasions used these to create centerpieces for our dinner tables! Forrest and The Trees rocked the party with 90's cover songs! Be sure to watch the above video from Kalimana Film Stories! She did a beautiful job of capturing the joy of the evening. A special thank you to Jenna Roberts for making Sarah look flawless for both the style shoot and party! Do you have an adoption fundraiser that you need help planning? Reach out to us! We hope to give coordination services toward one adoption fundraiser a year. Nashville is my home, but Texas is where I was born and raised. Most of my family and countless friends live there, so the devastation caused by Hurricane Harvey is deeply personal and heartbreaking. Seeing the floods on TV may not seem real, but hearing from friends that have lost everything and rejoicing with those who escaped the floods - that makes it real to me. I know there are many tragedies today; there's flooding in South Asia and fires in Montana, just to begin with, but right now, my heart is in Texas. I also have a deep faith in God and prayer. I think a lot can be accomplished by prayer, but God also calls us to act. But how can we act? What can we do? Undies for Everyone has an Amazon wishlist (really can't get easier than that). Or you can collect new, packaged underwear and mail it to the address below. Houston's local Hillel is collecting the items for UFE. Hanes or Fruit of the Loom are recommended! "Violence unmakes the world, but preemptive love has the power to unmake violence. We bring relief to families fleeing war in Syria and Iraq. We help refugees rebuild their lives. And we provide lifesaving medical care for children in conflict zones." Preemptive Love Coalition is mostly focused in the Middle East, but their home base is in Houston. These are dear friends of mine and they have staff on the ground in Houston, working with Christian and Muslim leaders, and first responders, to identify the greatest needs for now and for the future. 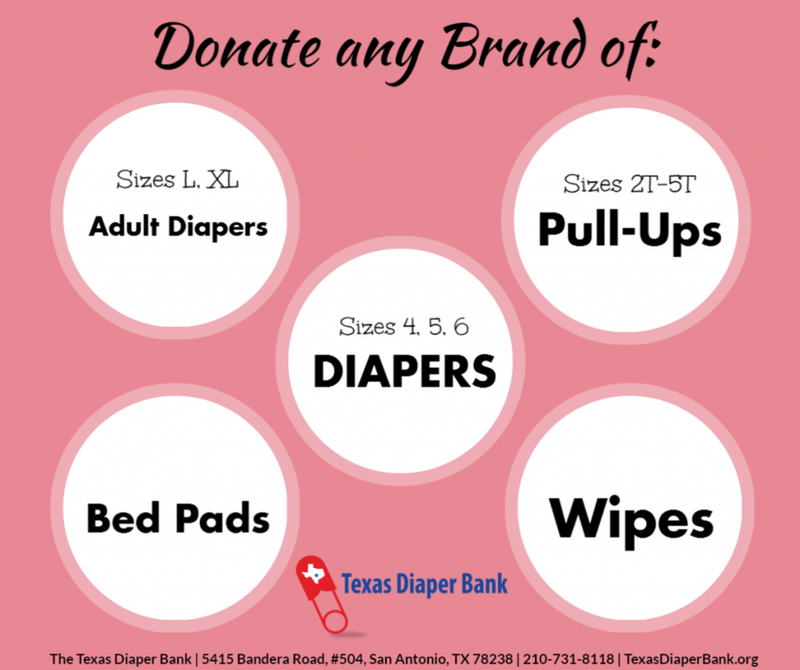 Texas Diaper Bank also has an Amazon wishlist! Convoy of Hope was on the ground the day that Hurricane Harvey hit. They were ready before this disaster reached the magnitude that it currently is. They have been and will continue to serve all of the areas affected. You can give donations on their website, or if you are in the area, you can volunteer to help with distribution and for later recovery efforts. There are so many options, these are just a few of my top choices. NPR also has an amazing list of options, with all of the major food banks in the areas that have been hit. Find what means something to you, find a way to make it personal and give there. Our church, Church of the City, is collecting donations in Franklin, TN and coordinating volunteers for rebuilding efforts in the near future. We have partnered with a Houston area church for these efforts. There are also many shirts proclaiming "Houston Strong" and "Texas Strong" that you can buy. It's not just a sentiment, it's reality - they are strong. They will recover from this. One day I may take my daughter to Mustang Island and show her where I vacationed with my grandparents, or we will go visit our friends in Houston and experience their resilience firsthand. I'm dying for a slice of pie from House of Pies as it is!